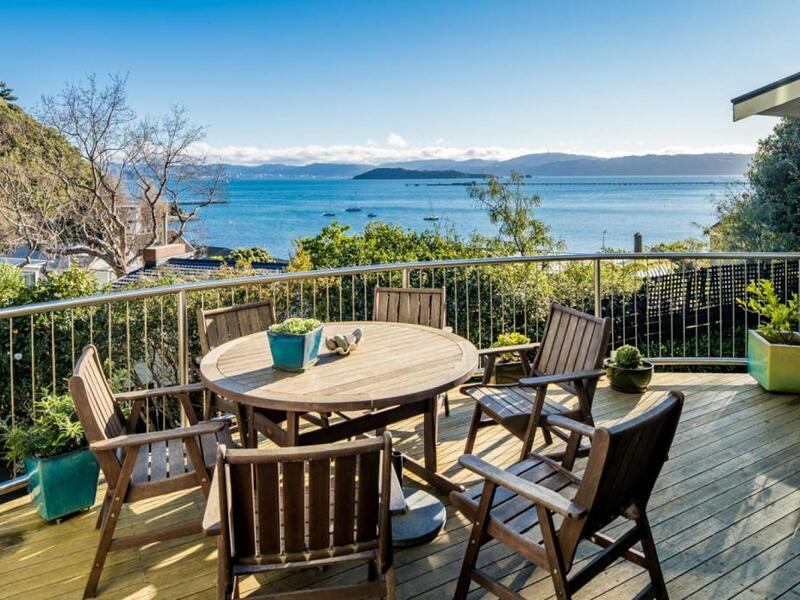 Within easy reach of Eastbourne Village, Wellington City and just steps from the beach. 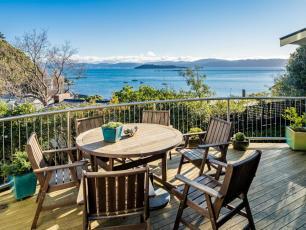 This sympathetically modernised 1960s home offers a fantastic lifestyle with a privileged mix of sun, shelter and sensational harbour views. The interior unfolds over two floors with three of the four double bedrooms, plus a shared ensuite and full bathroom, upstairs. The fourth is on the living floor, making it also excellent as a guest, work or media room. All have views that will make you want to stay here forever. Living is open plan and there are separate dining and sun rooms. Bi-folding doors open the house up to a spacious deck that is both sheltered and sun drenched. Further benefits include the kitchen upgrade and new gas central heating, double glazing and wood burning stove from 2013. A big internal access double garage (with separate workshop and storage space) complete a brilliant package in luxurious Lowry Bay. Homes offering this much are rare - call me today and see for yourself. I think you'll love it! Whichever entrance you choose, the welcome is the same - warm and inviting. One door takes you through the sun room to the kitchen, while a more formal entrance is into the front entrance hall which is also accessed internally from the double garage. This relaxing space is open plan to the kitchen, with polished floorboards and bi-folding doors that open up to the spacious deck. Day and night, whatever weather, the view is mesmerising. Fling open the doors to enjoy the summer, or languish around the wood burning stove in winter and count your lucky stars - literally!. Flowing from the living room, with cavity sliding doors that make it part of or separate from the living room, as required. The room is big enough to accommodate casual living in addition to dining. A further door leads directly to the deck. With an air of informality appropriate in a home so close to the beach, the sun room has direct access to the deck and kitchen. This is a fabulous spot for afternoon tea or a glass of wine at sun down. The spacious kitchen is a delightful place to prepare food for family and friends. The current owners undertook a major kitchen makeover 2013. A curved Generation IV Kings designed Rewa Rewa and Rimu island adds a beautiful aesthetic from the living room. Cupboard doors, stunning black granite bench tops, the stove and microwave oven - all were renewed with a focus on quality. In addition to the harbour view, the outlook takes in your lush, leafy garden. 1. A large double room, carpeted with radiator and two fitted wardrobes. Enjoy luxurious weekend relaxation from the comfort of your bed, looking out across the water at the yachts, passing ships and native bird life amid the trees. 2. A good double room, carpeted with a radiator, fitted wardrobe and direct access to the shared ensuite shower room. 3. A double room; carpeted with radiator, two double fitted wardrobes and easy access to the shared ensuite. 4. The only downstairs bedroom - a double with superb views to the bush and bay. With polished floorboards and a radiator, this room is also perfect as an office, media room or play space. 1. A large, welcoming, light filled room with bath and separate shower. 2. Conveniently between bedrooms 2 and 3. 3. A separate guest toilet, and third shower in the laundry (fabulous for washing off sand from the beach), are both located on the living floor. The laundry is excellent with direct access to outdoors, and the third shower. Flowing from the living, dining and sun rooms, the deck offers perfection for your al fresco dining and outdoor relaxation. Beautifully sheltered and sun drenched, its design enables you to enjoy this spectacular environment, with its stunning views and bird life to the maximum. Stone steps meander up and past mature and beautifully landscaped gardens. A big double garage has the luxury of an adjoining workshop and internal access. There is further parking at the property for 3+ cars. A large workshop area adjoins the garage. This home has generous storage facilities, including a secure area that is ideal for bikes, surfboards, windsurfers, kayaks, etc. A further space, accessible from the rear of the house, is the perfect spot for your garden equipment. Gas central heating with wall radiators throughout, plus wood burning stove (all approx. 2013).